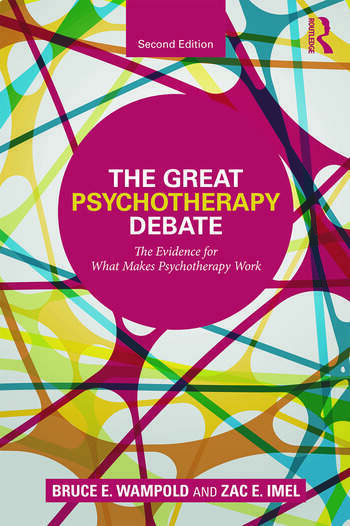 The second edition of The Great Psychotherapy Debate has been updated and revised to expand the presentation of the Contextual Model, which is derived from a scientific understanding of how humans heal in a social context and explains findings from a vast array of psychotherapies studies. This model provides a compelling alternative to traditional research on psychotherapy, which tends to focus on identifying the most effective treatment for particular disorders through emphasizing the specific ingredients of treatment. The new edition also includes a history of healing practices, medicine, and psychotherapy, an examination of therapist effects, and a thorough review of the research on common factors such as the alliance, expectations, and empathy. Bruce E. Wampold, PhD, ABPP, is the Patricia L. Wolleat Professor of Counseling Psychology at the University of Wisconsin–Madison and director of the Research Institute at Modum Bad Psychiatric Center in Vikersund, Norway. Zac E. Imel, PhD, is an assistant professor with the counseling psychology program in the Department of Educational Psychology and an adjunct assistant professor in the Department of Psychiatry at the University of Utah.